WORLD EXCLUSIVE!! Serious test for the video capability on the Leica T.
Well it may not actually be a world exclusive but I've found it very difficult to find anybody on the internet who has done an in-depth review of the video facility in the Leica T, nor indeed can I find any details on it (including from Leica). If anyone has any links for that I'd be grateful and I'll update this review. The first thing to say is that everybody dismisses Leica video. So let me put that right to start with. Below is a wonderful little video about a coffee company, shot by long-term Leica aficiando Edmond Terakopian, shot on a Leica M (Typ 240) and very good it is too. So what options do you get for video on the Leica T? Well you get just three video specific choices. Between 1,920 x 1,080/30p or 1,280 x 720/30p., video stabilisation on or off and wind cut filter on or off. So not much. No details of the video codec or bitrate that I can find. You can select manual focus and manual exposure, though to be honest I'm not sure the latter works. I suspect the video function is largely automatic for the exposure. You also don't seem to be able to preview the 16:9 ratio. It just switches to that whenever the red video on button is pressed. It also had rather good stereo microphones. So is it worth bothering? Well yes for several reasons. Firstly, the results are actually rather good. I don't know what the bitrate is but it seems quite high. The footage is certainly decent quality. The EVF and screen are also so good that you get to see what you are shooting very clearly. In fact I discovered that the best results are using the EVF. I hold the camera and look through the add-on EVF just like I'm taking a photograph. It works really well. Plus if you don't want to look like you are shooting video it is actually very good for that. The final thing the Leica T has is the most significant and in fact makes Leica's absence of options somewhat baffling. 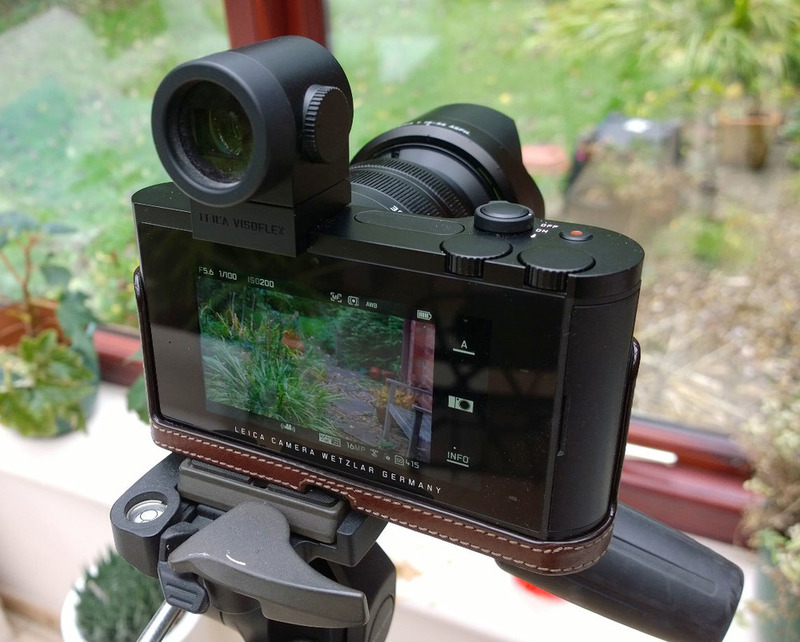 The Leica T has built in software video stabilisation. Yes you read that right. And this works when you are shooting the footage, so you see the stabilised image. Now I've never heard of this before and if anyone has I would again be grateful for info. you can share on this. So no lens IS, no body IS, but the ability to shoot stabilised hand held video 'on the hoof' I did in fact find it incredibly easy to just start shooting footage whenever I felt like it. I didn't have to do anything to select video, just press the red button. So in many ways, point and shoot video. So let's get to the sample below. For this sample I shot the first section in a Cotswold village at the weekend and that footage is 100% hand held using AF. The four clips at the end of the video were shot this morning in my garden with the camera on a tripod and manually focused. Lens used was the only one I have for the camera, the 18-56mm. Now I can think of lots of uses for kind of video shooting. It's simple, it's quick and easy to use, it produces good results and people are totally oblivious to you doing it. (Though they may wonder why it's taking you so long to press the shutter button!!) Apart from anything else the Leica T is not a big camera and despite what some people think, it is pretty anonymous from a distance. You actually have to get pretty close to see the red dot and the polished aluminium body. I do have to say that this is my kind of video camera. Simple, easy and just press the idiot button to set it going. But is it broadcast quality? Well, no, but that's not what it's for. Most video from this kind of camera is shot to be viewed on a computer monitor and on the internet. And indeed that's where all of the video I've shot commercially has ended up, apart from the weddings which ended up on a DVD. I'm not going to be shooting for movies or TV. And nor are the vast majority of people who buy these hybrid stills cameras with a video function. And for that the Leica T works and it actually works better than many of its's competitors in that class of camera. It is significantly better than the output I can get from my Fuji X cameras (higher bitrate) and also pretty close to what I get from my Sony A7r and a6000 and some of the Panasonic cameras I've used. Though the FZ1000 footage (non 4K) is a cut above. Plus it's way simpler to use than any of those other cameras. Some people might think that a disadvantage, but the possibility of getting some decent footage wherever you are just by pressing one button and with no messing about in menus strikes me as very useful indeed. Either for domestic or commercial use. So this isn't a camera for that first low budget movie you're dying to make. (Plus the cost of the camera would probably wipe out your budget anyway!!) But the video does make sense when you think about the 'philosophy' behind the camera. It's meant to be simple, to be minimalist and let the user concentrate solely on what's in the viewfinder or on the screen. Personally I'm all in for that approach. Because I'm done more than my fair share of fiddling around with cameras and it's one of the reasons I love the Leica T. Because I don't have to mess about with it. I just get on with shooting stills or video. That's the important bit. It really doesn't matter whether I take a picture at f/2 or f/2.8, at ISO 400 or ISO 800. What matters is I get an image that pleases you, pleases me and of course impresses someone else enough that they are prepared to part with some cash to use it. So what don't I like? Well I would like more information on what I'm actually shooting. Plus in dull light the colour balance goes somewhat towards purple as you can see from the sample.But then I can fix that in my editing software. Now I don't want all the bells and whistle of the GH4 or FZ1000, but a little less of the 'this is how it works, take it or leave it' approach would be nice. Would I use it for a commercial job? Well yes I would actually, simply because it's so easy to use., and it really is very stable hand held. One thing to remember incidentally is that because there is no lens or body IS the camera is actually silent. Which is a good job because there is no facility for an external microphone. So there it is. What I think is the first serious look at Leica T video. I certainly don't have any knowledge of anyone who has done the same. And I have to say the results I've got have endeared me to the camera even more. I really do love using it. I'm in the process of selling some stuff I rarely use because I'm going to be getting all the lenses. The LEICA SUMMICRON-T 23 mm f/2 ASPH., LEICA SUPER-VARIO-ELMAR-T 11–23 mm f/3.5–4.5 ASPH. and the LEICA APO-VARIO-ELMAR-T 55–135 mm f/3.5–4.5 ASPH. Now that is actually a huge investment, but I really REALLY like the system. Finally someone mentioned that the lens mount is actually pretty big. Almost as big as the EOS Canon mount, which does of course open up some intriguing possibilities. 'Full-frame' Leica T anybody?